I’ve been a fan of Garth Nix since I read his Abhorsen trilogy. The summer before I started college, I began reading his Keys to the Kingdom series. At the time, the first six books were out and I read them all in a few weeks. The seventh came out the following autumn. Three years later, I got around to reading it. Book Five in The Mortal Instruments series is one I’ve been wanting to read for a while. I love this series. I was hooked with the first trilogy (City of Bones, City of Ashes, City of Glass) and I was so sad when it finished, but then Cassandra Clare brought out a new trilogy continuing the story (City of Fallen Angels, City of Lost Souls, City of Heavenly Fire) and my heart raced with excitement. It might sound confusing as there are six books in the series, but the stories are grouped into two trilogies. 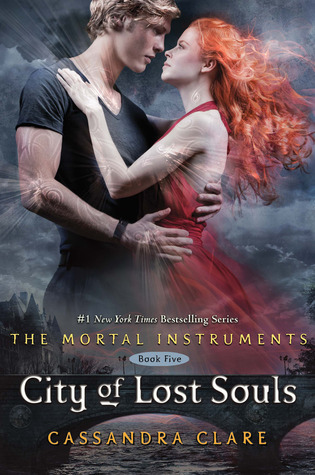 I’ve read City of Fallen Angels which started off the new trilogy and now I’ve finished the next book City of Lost Souls. The story follows on from the last. The great evil Sebastian has been raised from the dead and has run off with protagonist Clary’s love Jace. Everyone is searching for Jace, but when they find him they soon realise he is no longer himself and Clary will do anything to get her Jace back and stop her evil brother Sebastian from destroying the world. One of the things I love about this book is how it so fluidly slips from one characters perspective to another. It takes you from place to place and sometimes just different people in the same scene. It’s so nice to get inside of different character’s heads as there is a lot going on with the on coming war and not to mention everyone’s love lives. It seems that every couple in the book is having some sort of problem. Alec is jealous of Magnus’ past lovers. Clary is trying to save Jace’s soul. Isabelle won’t admit her true feelings to Simon. And Mia might finally be ready to forgive Jordan. The romantic drama is enough to pull you through, but this book is so much more than just romances and Clare writes her words with poetic brilliance. I found myself stopping to reread parts that just flowed, perfectly describing the scene so I could picture it in my head. And of course after five books you really have grown attached to all the characters which makes you more involved with all the romance stuff so much more. You’re watched these characters grow from book one, City of Bones, they’ve changed so much its hard to believe the people they used to be. I will also always admire someone who can write stories about people who love each other and might be brother and sister. Reading the first trilogy I was dying to find out if Jace and Clary would ever be together, and new trilogy is no different. With everything that is going on you can’t help but keep reading to figure out everything. What is Sebastian’s plan? What’s wrong with Jace? How are they going to save the day? Cassandra Clare is an amazing writer and this series is one that millions love (In fact City Of Bones is being turned into a movie as I write this). This is series was the Urban Fantasy that got me in to Urban Fantasies. A brilliant series that I would always recommend for people who love the supernatural world. Spark by Brigid Kemmerer is the second novel in her elemental series after Storm. Who wouldn’t love four hot brothers with elemental powers? Where the last book focused on the youngest brother, Chris, Spark is all about broody hot twin Gabriel and his problems with fire. Sometimes he can even control it.And sometimes he can’t. Gabriel has always had his brothers to rely on, especially his twin, Nick. But when an arsonist starts wreaking havoc on their town, all the signs point to Gabriel. Only he’s not doing it. And no one seems to believe him. Except a shy sophomore named Layne, a brainiac who dresses in turtlenecks and jeans and keeps him totally off balance. Layne understands family problems, and she understands secrets. She a few of her own. Gabriel can’t let her guess about his brothers, about his abilities, about the danger right at his heels. But there are some risks he can’t help taking. I love Kemmerer’s style of writing switching between the main brother and his love interest, Layne’s, point of view. It gives you clear insight into what they are feeling without having to share it with each other, which is what really drives it all. You watch these two fumble around hiding their secrets and misinterpreting each other, wishing they would just tell the truth to set it straight. I loved Chris’ character in the last book, Storm, and now I love Gabriel too. (I always loved Nick, but that’s because he’s clearly the best brother and better get his own book.) Gabriel is full of anger and confusion. He’s pushing people away including his twin and he just doesn’t know why. He’s complicated and isn’t that really what all girls love? A bad boy with issues. The story is full of action, mystery and romance. Kemmerer definitely keeps you guessing throughout the story, wondering what’s going on and if Gabriel will ever work out his issues and stop lashing out. You grow with these characters and feel for them. You’re fighting by their side and cheering them on. I like that it continues on from the last book too, so you still have the issues from Storm which play a more subtle role but are still important. Spark is definitely, as is Storm, a book worth the read if you love Paranormal Romance that is original and holds you from start to finish. I can’t wait for book three Spirit starring Hunter, and hopefully a Nick themed book in the future.